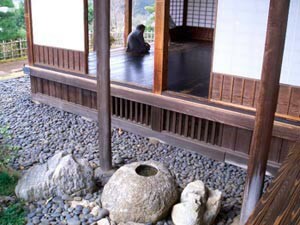 Budo in all its forms is a very special and inseparable part of Japanese culture. There are many sayings in Japanese that allude to the martial heritage of this proud and beautiful country. For instance, one way to say “give up” is “Kabuto wo nugu.” This means to take off one’s helmet. This is of course a reference to the Samurai helmet that was taken off as a sign of defeat in battle. 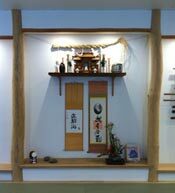 This is just one example of how the martial traditions permeate Japanese culture. I am a life-long student of the Japanese language and culture, and I wish to share my interests with my students. I find that very many people wishing to study martial arts also have a keen interest in Japanese culture. This is especially so in Aikido. I was lucky to have had such a good master in Saito Sensei, who taught me so many things from his rich cultural heritage. Chance had it that I met my wife, Midoriko, on my first trip to the Iwama Dojo. She hails from the same area as Saito Sensei, Ibaraki-ken (prefecture). Sensei said many times that she was so much help to him – in explaining difficult concepts to me when my language skills were lacking, cooking for him when he came to teach in Denmark, and in so many other ways. She is also very much a help to me, in teaching me even more about her country and its customs. She helps me in offering different cultural courses; sharing her knowledge and talents with my students.